> Unlike many “self-help” books, this one has an engaging narrative behind it, so not only are the bits of advice (“life-lessons”) extremely useful and insightful, but also the story of Andrew Bienkowski’s life will fascinate and move any compassionate reader. And, it should be pointed out, the authors don’t really consider the book to be “self-help.” Rather, it is a “help-others” book. It is a blueprint for living a life that is less self-centered and is more about being involved in the lives of others than helping yourself. 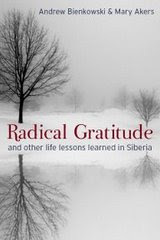 Radical Gratitude, co-written by Mary Akers and Andrew Bienkowski, is divided into fourteen Life Lessons derived from Bienkowski’s life as a child when he and his family were exiled from Poland to Siberia. They endured incredible suffering that the book can only really hint at. But through the suffering and the sacrifices of others, Bienkowski learned. And so the reader learns about the concept of “Radical Gratitude”—taking nothing for granted and remembering all the things in our lives with which we are blessed. We also learn about Listening, Hope, Perseverence, Letting Go, and Love. But these are not abstract lessons at all. They are concrete suggestions for living a more fulfilled life skillfully crafted by Bienkowski, a therapist, and Akers, a talented writer. The total package is one that will be hard to put down and even harder to forget. I have hesitated to post a review of this fine book because it is published only in Australia and New Zealand (by Allen & Unwin) at the moment, although editions are scheduled next year in Europe and Canada. In the meantime, you can purchase a signed copy directly from the authors. It’s well worth it. For more information about the book, see my interview with Mary Akers which appears in the April issue of Eclectica Magazine.